After he told you he loved you just the way you are, after he vowed to catch a grenade for you, after he jumped into a spur-of-the-moment-wedding with you, Bruno Mars now just wants to leave everything behind him, and have a long day at home doing, you guessed it, nothing. Peter Hernandez, better known as Bruno Mars, originally started off as a songwriter/producer in the Smeezingtons team, but has been flooding the airwaves since he collaborated with Travie McCoy on Billionaire in 2010. Though he’s vocally talented, I really can’t stand him because he’s pioneered “fiction-pop,” meaning that all of his songs have to do with something that won’t ever or very rarely come true. His latest single, now playing on all radio stations, is no different. 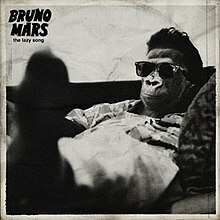 Just like the title “The Lazy Song” suggests, the song is very laid back, mainly because its draws its elements from reggae music. It’s also heavily influenced by the general feel of Hawaii, where Mars hails from. The guitar cords may seem very familiar because they’re very close to the ones he used on Billionaire and sounds very easy to play. Regardless of that, it’s still classified as a pop song because of it happens to be very catchy. Unlike his past singles, Bruno makes no effort to hit any screechy high notes and just sticks to his simplistic approach towards things. This is a definite welcome change and keeps the song at its lovable state. Lyrically, its fun and upbeat, and tackles on our everyday desire of just not being disturbed. As a college student, I can completely relate and there have been many, many days that I have felt this way or have stayed at home and not combed by hair. He goes through all of the motions of a perfect lazy day like lying in bed, not picking up the phone, defying everyone, chilling, and being the king of his own castle- and that’s where his fiction pop kicks in. He’d rather blow off getting a college degree to be lazy- wow, that does not resonate well with me at all. Though thew single has been released on February 15, the video is still not out yet, as is the case for Marry You, but I’ll be sure to keep you posted when it does. It’ll be very interesting to see how the approach he takes here is going to translate into visuals. My final verdict? I really want to hate this song because it’s a Bruno Mars one and I really don’t like his style but it’s so catchy and spot-on that I’m very sure I’m going to keep replaying it over and over again as the summer approaches. 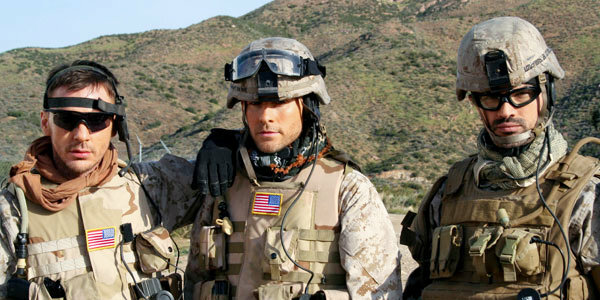 In June 2010, a teaser trailer for the title track from 30 Seconds to Mars’ second single from their album This is War was released onto Youtube showing the band decked out in military gear and carrying weapons, as inspired by the song’s central theme of war and peace. For almost a year, the very fate of that video was unknown and fans anxiously waited for any news about it. The wait, however, is now over. On April 1st, the band, and through their social media sites, asked all their fans to refrain from watching any leaked videos and that they would be posting the official clip very soon. That came true on April 6th, when the full-fledged video was uploaded to their Vevo channel, and has already managed to garner an impressive number of views. Where are Shannon and Tomo exactly? Although they’re in the video, it’s at rare instances that you see their faces, and even then, they’re wearing sunglasses/goggle. I would’ve loved to see more of them because the dynamic that this trio have-in terms of their music-is beyond incredible. Where do all the flying objects come from? I know I know, this all serves an eventual purpose, but it just seems so random! They’re in a very deserted area and out of nowhere, tanks d are flying. This would’ve been so much more believable if we see whose launching these things at them. I know most, if not all, of the Echelon would’ve loved to play a small part in the video. The typeface. I can tell its a Bartholomew Cubbins “movie” just by the lettering he uses in the historical scene. He doesn’t have to include the opening or end credits for us to know that it’s his work of art. 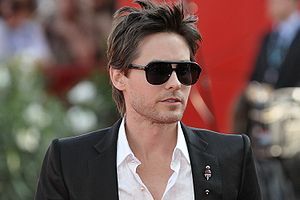 For those of you who don’t know, Bartholomew Cubbins is nothing but a pseudonym for Jared Leto. On a side note, this isn’t a Cubbins film, but rather was directed by Edouard Salier- something that Leto isn’t keen on repeating in the future. Why is there a censored and uncensored version? Unlike Hurricane, where an uncensored version for the more sensitive/conservative viewers was needed,there’s nothing in This is War that needs censoring, not even blood. The theme. Definitely spot-on. For a song with such powerful lyrics and obvious discontent at the state of the world, there would’ve been no better theme to use than fighting in Afghanistan. Although, I do have a hard time believing that pretty-boy Jared would ever be engaged in such kind of combat. The historical shots. Because the issue is so contemporary, it would completely make sense to use images and clips from the huge historical archive available. What I like the most about this is that it’s very blunt, like putting the image of George W. Bush with the words “moment to lie” set on it. There’s no doubt about what the group thinks about the state of current affairs. Incorporating little elements: If you look very closely, you’ll see that each of the helmets has a little inscription it. Jared’s has This is War, the name of the album and the very song, Tomo has the very inventive Mars logo, while Shannon has L490, the one track on the album he wrote, and also says that in the short break from the song scene. No real idea what it signifies, but if you do, do tell! The cinematography. Wow! This is a common thread in all of Mars’ videos- they’re just a spectacle. Whether it’s the chilling Hurricane, the inspiring Kings+Queens, or the for-the-fans Closer to the Edge, there’s always something that draws you into their videos. Here, they take something so bare as a battleground and turn into more than just an area of discourse and disruption: it’s more of a beautiful chaos. In the end, the coming together of the triad and the guys observing it, it’s only a thing you can fully comprehend if you watch the entire video. These are my thoughts on this video. I am very much enjoying the whole 30 Seconds to Mars fandom, especially when they’re making such great videos (excluding the very strange but beautifully shot Hurricane). I only wonder what they’re going to do next. gave us a memorable song by the name of Where Is the Love? The song combined a fresh style with socially-conscious lyrics that made people re-evaluate the world they were living in, all in 4 or so minutes. 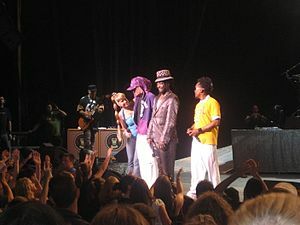 The band, as is known, continued to be successful despite allegations of them plagarizing almost all their hits from other sources. Somewhere along the line, though, they went from being all about hip-hop into David Guetta‘s dream-project, as demonstrated by their last album The E.N.D, where their most successful song, at least in this country, I Gotta Feeling was produced by said person. So, bye bye hip-hop, and hello really cliche electronic music. Well, they’re doing it again with this month’s release of *drum roll please, because really this is going to be a surprise* The Beginning, which judging by the album’s first single is going to be very, very much like it’s predesecor. Ever since TnT has started, I’ve been doing reviews of songs that are either newly released or that I’ve recently discovered. I’ve realized however that I’ve never shared the songs that I cannot get over no matter how old they get. Then a prompt I found on Plinky really set this in motion and so these are the three songs that no matter what happens, I cannot remove from my iPod or stop singing to myself. I don’t usually like dance music and its derivatives. Instead, I prefer rock music with all its grittiness, memorable guitar solos, and actual lyrics. But for today’s feature, I’ve chosen a song that’s a bit out of my range, and one which I have recently rediscovered. You might remember The Sound of Missing You by Belgian-Tunisian singer Ameerah from the Winter of 2009, especially since radio stations were playing it on rotation. There’s nothing wildly exciting about this track, but I do like the idea of the silence having a sound, and relating that to missing someone. The vocals aren’t that bad either. And it gets easily stuck in your head. I’m pretty sure almost all electronic music fans are going to go all out on me for choosing this song, especially that there are much better songs, but at the moment, this is what’s stuck in my head. Here’s the video for your viewing enjoyment.